Automated Packaging Systems has introduced three new materials for the AirPouch® FastWrap™ protective packaging system, which produces cellular cushioning wrap and air-filled tubes on demand. This portable, benchtop unit reduces the storage and shipping costs of large, bulky rolls of pre-filled protective wrapping material by producing the material as needed at the packing station. New 24-inch wide FastWrap material is now available for wrapping and protecting extra-large products. This material features the exclusive channel-filled honeycomb design found only in AirPouch products, which allows multi-directional wrapping and improved product protection. 24-inch FastWrap is available in both standard LLDPE and EarthAware™ Biodegradable blend. 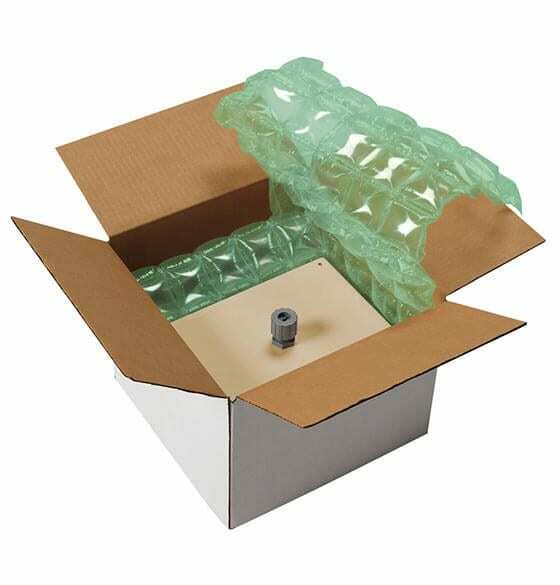 One small box of pre-formed 24-inch AirPouch FastWrap provides 1,029 feet of protective wrapping material once inflated. Innovative system Airspeed HC is a significant packaging solution, because products of all shapes and sizes are maximally protected. Air bubbles HC versa can maintain the shape and protective properties after bending, handling and wrapping. HC versa creates small air bubbles with the speed of 23 meters per minute. The production process of air bubbles HC versa can handle even a child. The machine is managed by means of start and stop button. Airspeed HC versa system uses high-performance film, which is made from low density polyethylene and it means that the film is 100% recyclable.Airspeed HC is unique by saving the storage space.One pallet of the foils of HC versa = 1.5 truck in the form of traditional bubbles.